The Australian government frequently lectures PNG on its corruption record. Australia presents itself as the clean neighbour, prepared to mentor PNG onto the straight and narrow. The Manus Island detention centre scandal strongly suggests no. It put a spotlight on a series of highly suspect Australian government contracts awarded to dubious outfits, linked to senior PNG politicians. The Australian response, has been muted to say the least. While the Paladin and PIH scandals have rightly dominated the headlines there is another recent story that also casts Australia in a hypocritical light. During early February the first naval ship to be gifted to Papua New Guinea under Australia’s latest $2 billion Pacific Patrol Boat Program arrived in Port Moresby. It proudly bares the name of a man who helped sire modern day corruption in PNG , Ted Diro. In 1991, Diro was found guilty by a Leadership Tribunal on eighty-one counts of serious misconduct in office and was recommended for dismissal. Diro resigned from Parliament before he could be sacked. The charges against Diro arose from the very first major inquiry into corruption in post-Independent PNG, The Commission of Inquiry into Aspects of the Forest Industry. Headed by Australian judge Thomas Barnett, the inquiry uncovered how, as Minister for Forests, Ted Diro unlawfully allocated a timber permit to a company which he owned with Malaysian businessmen. The company then ‘indulged in various transfer pricing schemes to fraudulently transfer tax free profits to Singapore’. According to Barnett, Diro was also ‘party to, and the main beneficiary of, a scheme to transfer massive profits through a New Jersey company’ and ’personally stood to gain USD 3,292,800 overseas by way of transferred profit and USD 1,774,700 in PNG by way of “legitimate” dividend’. Diro and his wife were also alleged to be the beneficiaries of numerous other unlawful perks including international air travel, vehicles and various cash payments. When his illegal scheme collapsed, Diro ‘quite improperly, and in great haste’ issued a logging permit over a neighbouring timber area ‘thus committing Port Moresby’s intended reserves of domestic sawn timber to be exported overseas in log form’. Is this the type of behaviour Australia rewards esteem and recognition to? 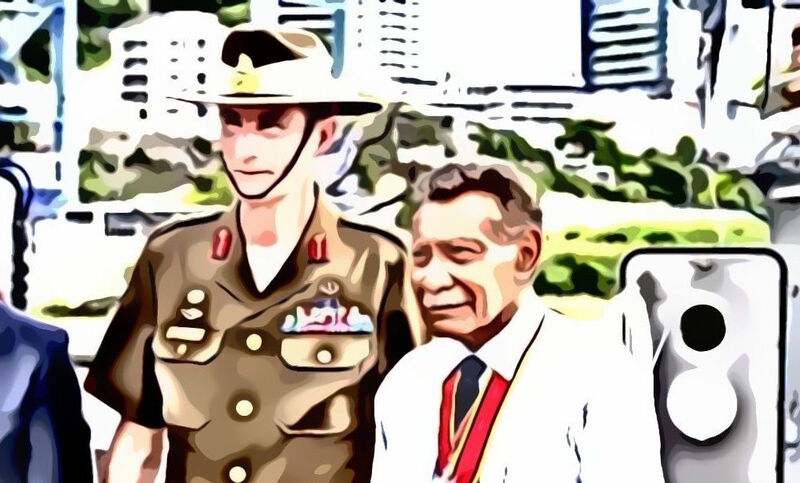 Why couldn’t the Australian government find a soldier who served his country with distinction, and valour, not implicated in one of the country’s worst corruption scandals? Under Australia’s $2 billion Pacific Patrol Boat Program, four naval vessels will be delivered to PNG and others to it’s Pacific neighbours. The boats will, it is claimed, ‘significantly strengthen security in the region’. Dignitaries including Australian Federal Minister for Defence, Christopher Pyne, Minister for Defence Industry Steven Ciobo, WA Minister Paul Papalia, and Senator Lynda Reynolds, pose in front on HMPNGS Ted Diro in November 2018. Compounding matters, an indecent scrummage of senior Australian politicians turned up for a photo in front of HMPNGS Ted Diro, so they could be snapped alongside a vessel named after a man dismissed from office for 81 counts of misconduct! As the controversy over Australia’s highly priced contracts with the Paladin group and others for services connected to its refugee detention programs rage on, and with questions being asked over whether they allowed scope for ‘sweeteners’ to be paid in PNG, the HMPNGS Ted Diro is another reminder of how Australia is seemingly happy to endorse PNG’s crippling corruption.